When a stranger gives Analiese Jordan a list of names before he dies, the last thing she expects to see is her own on it. Not. Cool. Her search for answers leads to the man’s grandson, Marek, who has dangerous secrets of his own. Both are determined to unlock the mystery of the list. But the truth is deadly. Analiese is a descendant of the God of Death, known as a Riser, with the power to raise the dead and control them. Finding out she has hidden powers? Cool. Finding out she turns corpses into killers? No, thank you. 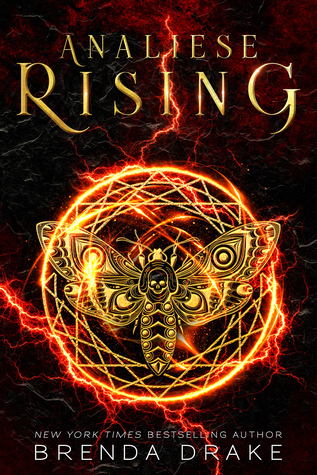 Now the trail plants her and Marek in the middle of a war between gods who apparently want to raise an army of the Risen, and Analiese must figure out how to save the world—from herself. The classroom smells like a funeral home. Hushed voices pulse over the pairs of students hunching over trays spaced across the counters. The odor of bodies fresh out of gym class mingles with the scent of formaldehyde. Hair dampens at my temples. A crematory would be cooler. Not many have finished their assignments. Only a few overachievers sit in the rows of empty desks on the other side of the room, their tasks completed, proud smiles on their faces. Mrs. Cryer shuffles around the tables watching over us—a reaper waiting for lost souls, her bony finger pointing out errors. She shuffles around with purpose. She shuffles around without direction. Then she stops at our table, her eyes peering over reading glasses. Biology is my least favorite class. Mrs. Cryer’s assignments are outdated. It’s her last year teaching, her retirement long overdue. Stern and direct, she’s not the sort of teacher I usually like, but I do. There’s an underlying kindness to Mrs. Cryer. A kindness hiding in her eyes, evident in her actions. One of the things I like about my school: my brother, Dalton, is in the same grade. We’re not twins or anything. Actually, we’re cousins. His parents adopted me when mine were killed in a boating accident on Lake Como in Italy. I don’t remember them. I was two when that all went down. The thing I hate about school: Dalton’s in my biology class. The little green body looks rubbery—almost fake—crucified to the tray with pins as it is. I push strands of dark hair from my face with a latex-gloved hand. I could’ve opted out of this barbaric ritual of separating body parts from an innocent frog. Why did I even agree to this?